Who doesn’t love to play with their food? 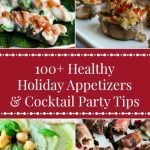 Today, I’m sharing a festive and healthy way to play with your food. 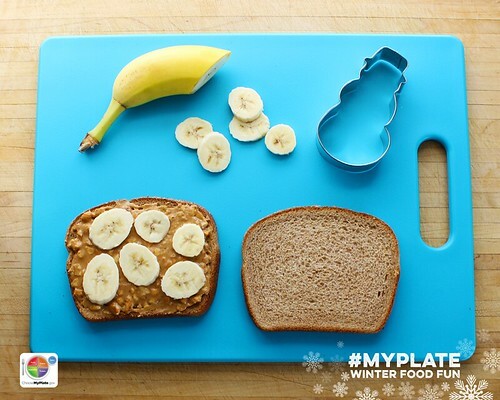 #MyPlate Winter Food Fun has a super fun and creative holiday idea to get us started. 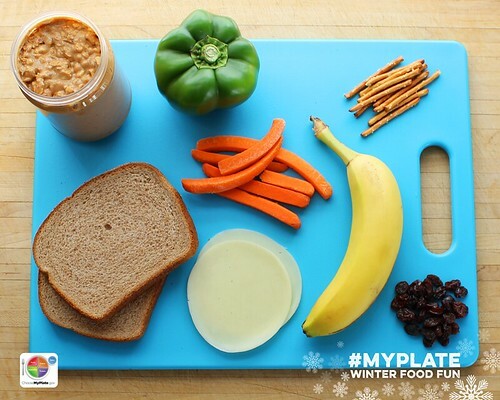 Take a look at this Edible #MyPlate snowman scene that includes all 5 food groups. 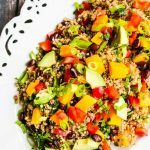 This winter, while the kids are home from school and family and friends gather together, you can experiment with ways to make healthy foods festive and fun. 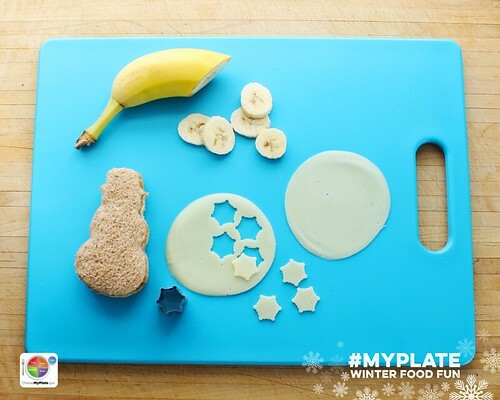 This blog shows how we created a snowy scene using foods from all five of the MyPlate food groups. We will continue to share ideas throughout the season on the MyPlate Facebook page, @MyPlate Twitter, and ChooseMyPlate.gov, and we want you to join in the fun. 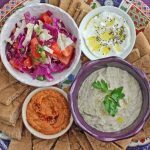 Get creative in the kitchen and find ways to make healthy foods the main attraction at your winter celebrations! Before getting started, be sure to wash your hands. 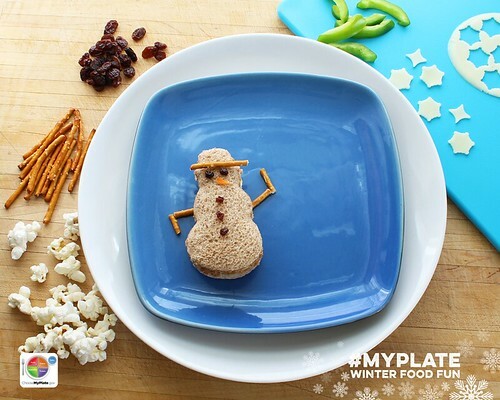 Edible MyPlate Snowman. Step 1. Step 1: Gather all of your ingredients and supplies. You’ll need whole-grain bread, peanut butter, a banana, raisins, a carrot, pretzel sticks, low-fat cheese slices (a white cheese will work best), your favorite green vegetable (we used a bell pepper), and edible snow (we chose air-popped popcorn, but a light colored cereal would work as well). 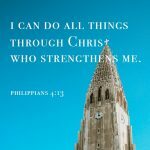 Be creative and use what you already have on hand. You’ll also need the following supplies: butter knife, snowman cookie cutter, cutting board, and a small snowflake cookie cutter. Edible MyPlate Snowman. Step 2. Edible MyPlate Snowman. Step 3. 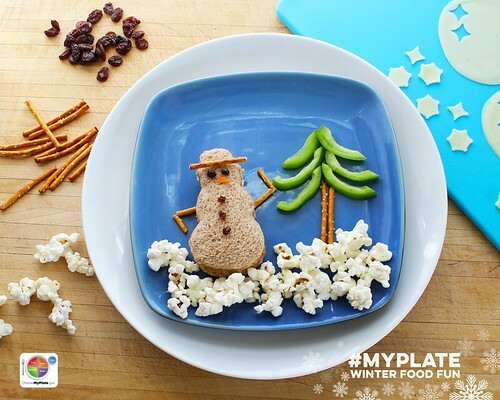 Edible MyPlate Snowman. Step 4. Step 4: Now it’s time to create your scene! Relocate your snowman to a plate (a plate in a solid color works best) and give him a face, hat, buttons, and arms. If it’s cold outside, he may need a scarf too. Edible MyPlate Snowman. Step 5. 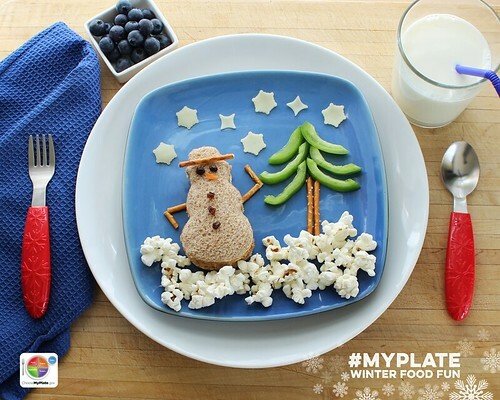 Edible MyPlate Snowman. Step 6. Step 6: Let it snow! 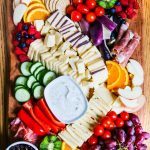 Add cheese snowflakes or snowballs to complete the scene on your plate. Add seasonal tableware and napkins to complete the scene on your table. Step 7: Any finishing touches? Have fun and make it your own. 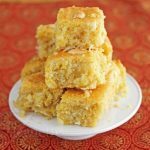 Orange and yellow low-fat cheese can be used to add stars or a sun to the sky. Plant extra trees or build a house. 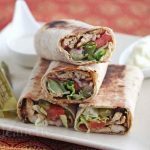 Then eat and enjoy! Reposted with permission from USDA blog. 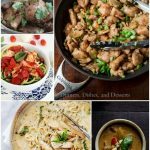 Check the MyPlate Facebook page, @MyPlate on Twitter, MyPlate Recipes on Pinterest) and ChooseMyPlate.gov throughout December for additional Winter Food Fun ideas. So ADORABLE!! You are so creative and talented, Jeanette.